Life is so busy. There’s much movement every day. I wake up and find the energy to launch from my home base, going to this place and then the next one. At the end of the day, I return home. These paths feel like a sort of orbit, circling around my home but always returning to it. While traveling, I cross over streets and boundaries. My path intersects with many others. Sometimes our paths align and we travel together for a while. When we’re together, we interact in countless ways. The transportation machines of modern life, like bikes, cars, transit and planes, physically move us around. Technology enables us travel even further, going to far-away countries, interacting with people around the globe, and connecting in online meeting spaces. Spacecraft, like NASA’s New Horizons, take us to the far reaches of our known world, circling back to us through images sent through space. Books transport the reader to real and imagined settings. Spiritual practices help us get to mystical, non-physical states. 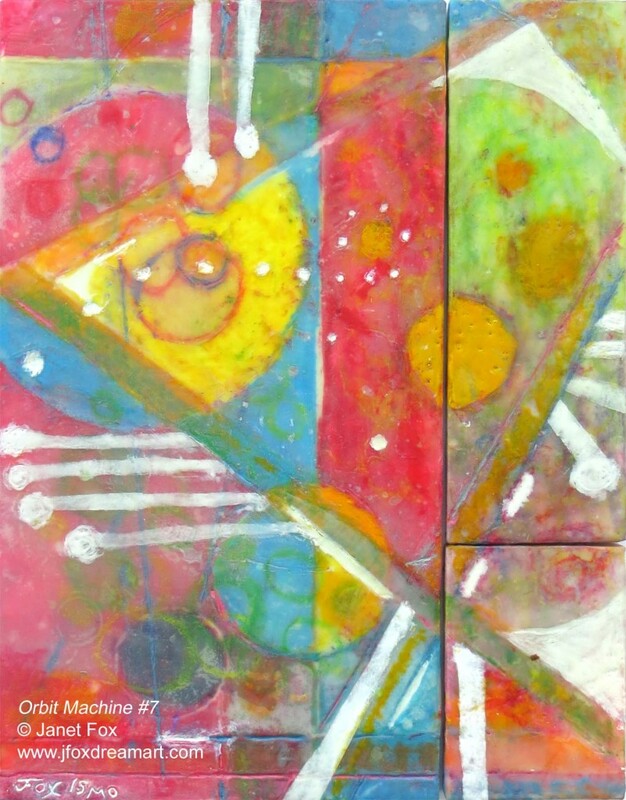 This encaustic art, Comings and Goings (aka Orbit Machine #7), represents the motions of life moving around in a weekly cycle. First going here, then there, then over there, and circling back around to home. I layered colorful pastel-infused papers fused in encaustic media in this three-piece painting, cutting grooves to fill in more colors. Where do your daily travels take you?